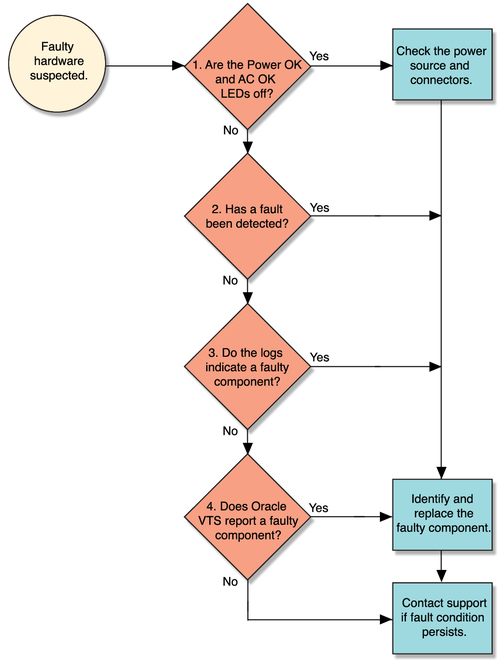 This flowchart illustrates the general process of diagnostics for this server. Depending on the fault, you might need to perform all of the steps or just some of them. You also might have to run diagnostic software that needs to be installed or enabled. This table provides descriptions of the troubleshooting actions that you should take to identify a faulty component, along with links to topics with additional information on each diagnostic action. Note - The diagnostic tools you use, and the order in which you use them, depend on the nature of the problem you are troubleshooting. Check Power OK and AC Present LEDs on the server. If these LEDs are not on, check the power source and power connections to the server. Check the log files for fault information. If system messages indicate a faulty component, replace it. You can obtain information from various tools such as Predictive Self-Healing (PSH), Oracle ILOM, or Oracle Solaris OS. Type the fmadm faulty command to check for faults. If the fault is detected by PSH, refer to the PSH Knowledge Article web site for additional information. To run Oracle VTS, the server must be running the Oracle Solaris OS. If Oracle VTS reports a faulty component, replace it. If Oracle VTS does not report a faulty component, run POST. The majority of hardware faults are detected by the server's diagnostics. In rare cases a problem might require additional troubleshooting. If you are unable to determine the cause of the problem, contact your service representative for support.